We’ve covered all kinds of games here at Polyhedron Collider, ranging from tabletop battle games with rank and file miniatures through lightweight party games all the way to hefty Euros (a particular favourite of mine, I might add). The subjects of these games is just as varied, covering such topics as oenology, Vikings beating up monsters, hiding from aliens in the dark and of course going mad in a big old house. We’ve never considered advanced horticulture as a subject for a game, let alone played one. That is until we got our hands on Photosynthesis from Blue Orange. The game is quite nicely captured in the title; use the sun to grow your plants (trees in this case) and score points for as they complete their lifecycle based on where they are on the board. Of course, life isn’t ever that simple and there’s the natural competition for resources that all life-forms must go through. Sunlight being the resource on offer here, which players try to capture as much of as possible by placing their seeds, saplings and trees on the board whilst simultaneously denying their opponents the same luxury. Gameplay is quite simple; get light points based on the number and size of trees that can see the sun and spend them to grow trees, ultimately getting them to full size, killing it to score points which are represented on asymmetric tokens which decrease in value as players take them, so there’s a race to get your trees to the end of their life the fastest. Each turn, the sun moves round the board and this introduces the lovely shading mechanic. Trees cast a shadow and anything in that shadow doesn’t see the sun for that round. 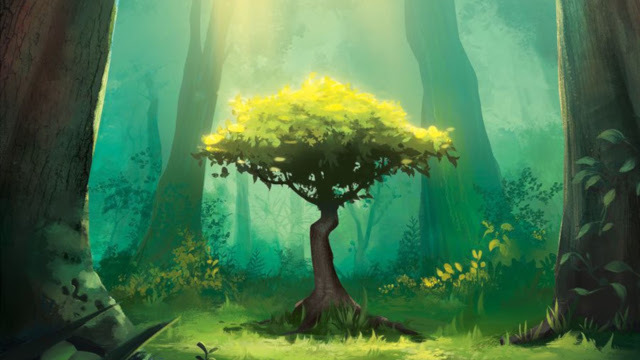 So you need to plan where to grow your trees to get the most light each turn and block your opponents so they don’t get any; we do love a good bit of dickmovery of which there is plenty to go around here. Place a tree to screw your opponent, watch as another does it to you. 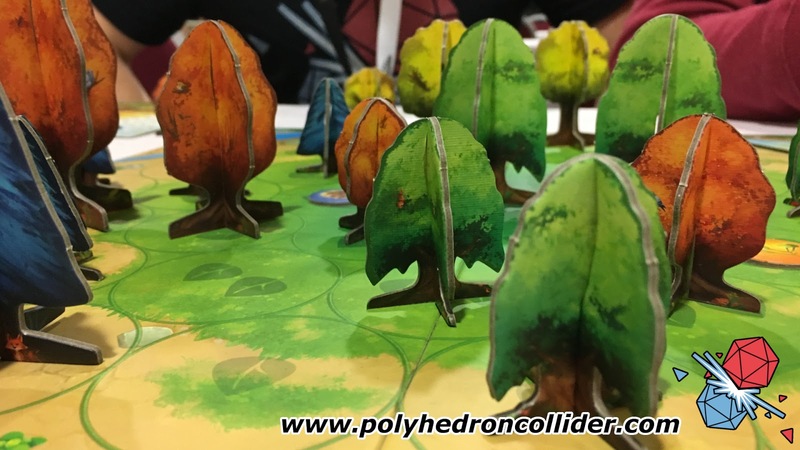 And be careful when growing your trees as you may inadvertently shadow your own trees, something all three of us here at Polyhedron Collider have fallen foul of on occasion, much to the delight of the other two. Spending light points is done either to buy trees or seeds to put in your available pool or to “grow” a tree by replacing one of your trees on the board with a bigger one from your pool. So there’s also an element of resource management in here too, which further adds to the fun. One additional twist is that if you don’t have room to store a tree or seed on your player board, it’s lost forever so think carefully when you grow things. There’s a set of trees each for up to four players although scalability is a little lacking to be honest, there’s nothing really to squish the game down for fewer players so for two, there’s much less interaction than at the four player level. Given the competition for resources is a key element in the game, this could be improved; perhaps by shrinking the board. The game is definitely better to play with three or four players unless you're one of those friendly hippy...um...tree huggers. I must say that Photosynthesis is gorgeous. The cardboard trees look amazing, the artwork is stunning and it’s all high quality. With it priced around £30, it’s good value for what you get. Both myself and Jon have a copy of Photosynthesis and Steve isn’t far behind so it’s looking like Photosynthesis is on for a much-coveted Polyhedron Collider “Three for Three” award [or should that be 'tree for tree'-Steve]. Despite the minor criticisms I have of Photosynthesis, I really love it. It’s light enough to get into quickly, but has enough depth to keep the brain engaged. Especially if you have an evil streak. It’s relatively cheap and looks great so many of the boxes are getting ticked for me. And would you look at that. I made it all the way through a review without making an “I’ve got wood” joke. Miracles do happen.